Upon logging in, you will view the Plan tab. This area of the website is for managing the redistricting plans available to you to edit (if logged in with an account) or view (if visiting as a guest). In the redistricting world, a plan is a complete set of districts for a state or locality. You are not required to create a complete plan for all the districts, you could, for example create a plan that has only a single district. We treat all partial or complete plans the same. You must select a plan to edit before you can start mapping. As you look at the Plan Tab, you will notice that there are four numbered steps that you need to take to start drawing your first map. We will walk through these four steps in turn, below. There are two types of layers that you can draw, legislative bodies and communities. The web site administrator will set up one or more legislative bodies for you to draw districts for. For a typical state, the following legislative bodies will be available. The administrator may make other legislative bodies available for editing. For example, if configured for local redistricting, county supervisor, city council, or school districts may be available. The administrator configures these legislative bodies for you so you can get started mapping without having to set parameters for each legislative chambers' districts, such as the ideal population size for the districts and the target number of minority-majority districts. Only administrators have the ability to change the available legislative bodies. Community maps are different from legislative districts in that criteria such as equal population are not applied to communities. You can draw essentially an unlimited number of communities, however, communities cannot overlap one another. If you wish to create overlapping communities, you must do so by creating separate community maps. The next step is to select a type of plan to edit. There are four different types of plans that you can interact with. Template plans are pre-generated plans that are provided by the administrator. They are intended to be recommended starter maps. These may be the current plan, a blank plan with no geography assigned to a district, or any other plan that the administrator may choose to designate as a template. 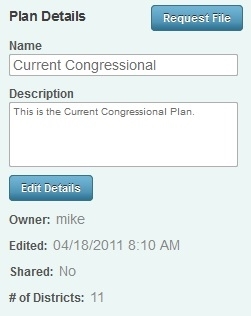 Shared plans are plans that you or other users have shared that are available to everyone to view or make a copy of and edit. 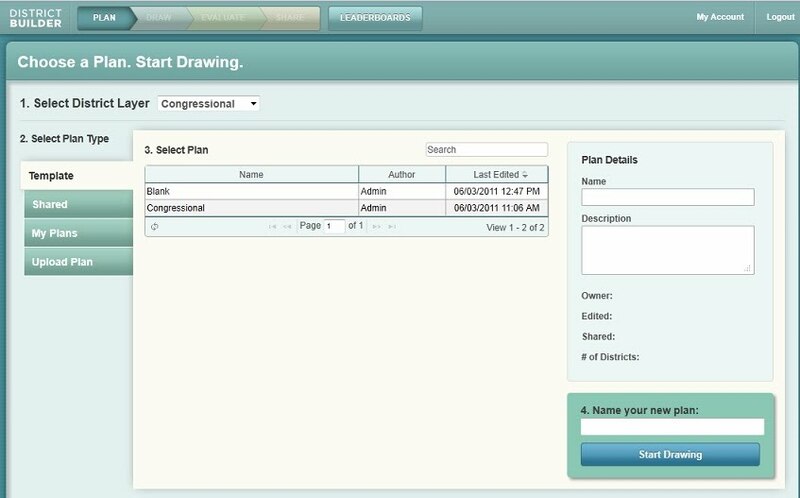 Upload Plans are plans that are generated by other redistricting software, such as those posted by a legislature or redistricting commission, that can be loaded for you to view, edit, and share. If you click on Temple, Shared or My Plans, the list of plans in the Action 3. Select Plan will change accordingly to show you the available plans in each category. 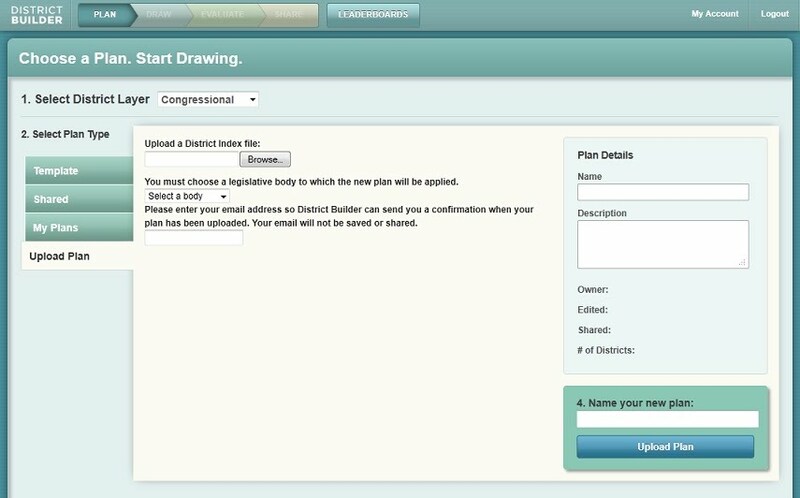 You can upload plans generated from other redistricting software, such as those produced by commercial vendors. These files must follow a special format. There are three important components to this format, the format of the records, that the file have an extension ending in .csv, and that the file must be zipped. OPTIONAL: a third comma delimited field can be added to each line that identifies the number of seats assigned to a district. This is for use in states where the software has been configured to support multi-member districts. A comma separates the census block identifier with a district code, the district that is associated with each census block. Second, the file must have a .csv extension for the file name. For example, the file name "foo.csv" is acceptable. The extension .csv is a common naming convention for comma separated files. Third, the file must be zipped, or compressed. There are many free programs that zip files. There are six steps to upload a plan. Select the Upload Plan tab to view the upload dialogue boxes. Click "Browse..." to point the software to the file you wish to upload. This will open a dialogue box that will aid you to locate the file. Select the legislative body you wish to upload a plan for. (Optional) provide your e-mail so that an e-mail may be sent to you when the upload is complete. Give your plan a name, in the box located in the lower right corner. It will take a few minutes for the software to load the plan. The amount of time will depend on a number of factors, including how many other people are using the software. If for some reason you do not receive an e-mail, check back in a few minutes to see if your plan shows up in the "My Plans" list. You can work on another plan while the plan is being uploaded. There are two methods to download a plan. The first method is available on the Step 1. Plan tab and the second method is on the Step 4. Share tab. Method 1, from the Step 1. Plan tab. Once a plan is selected (see Action 3. Select Plan, below), a "Download" button will be visible. Click on this button and the software will generate a file in the same format as described in the Upload Plan instructions, above. It may take the software up to a few minutes to generate the requested file. Once a file has been requested once, it is cached and should be available for download immediately when subsequent requests are made. When the file is ready for download, a dialogue box will open guiding you on where to save the file. Method 2, from the Step 4. Share tab. A file for download may also be requested from the Step 4. Share tab by pressing the "Request File" button. The plans that are available for editing are displayed in the Action 3. Select Plan area. The name of the plan, the author, and the last editing date/time are displayed. 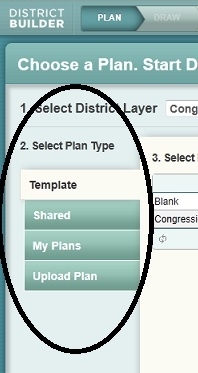 For "My Plans" a check box is also displayed identifying if a plan is a shared plan, visible to everyone. By clicking on the the Name, Author, and Last Edited headers, you can sort the plans available to you accordingly. (You may also sort by shared status for My Plans.) If there are many plans, navigation buttons at the bottom of the list of plans will be available. Clicking ►> will move your forward (or backward) one page of plans, Clicking ►| will move you to the end (or beginning) page of plans. You may also enter a page number and press return to go to that page of list of plans. You may search for a plan by entering the search string into the text box in the upper right of the Select Plan area and pressing return. If you have selected a Template or Shared plan, you must name your plan before you can continue. Enter the name you wish to call your plan in the box in the lower right hand corner. Press "Start Drawing" to begin map editing. If you have selected a plan in the My Plans list, you have already given the plan a name so you do not need to do this step. You will be presented with two options, to edit the plan and to make a copy. It is possible to make a copy of a plan that is in the My Plans list. You may find this useful if you are at a point in creating a plan where you want to explore different options. Select a plan from the "My Plans" list. 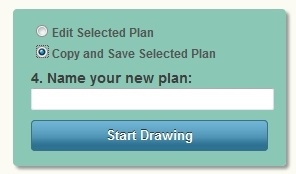 Click the radio button "Copy and Save Selected Plan"
If you select an existing plan from the plan list, additional information in the Plan Details area will be available describing the plan: the owner, the time stamp of when the plan was last edited, if it is shared, the number of districts in it, and a "Description." If a plan is owned by you, you may edit the description by clicking the "Edit Details" button. You can then enter or modify text in the description box. When satisfied with your new description text, click the "Save" button that will appear after you clock "Edit Details".